Looking out my window into the pre-dawn darkness, I am met by the bright white of yarrow flowers (Achillea millefolium and A. lanulosa) that have finally appeared in my garden. The flower heads are actually a flat-topped cluster of tiny individual white to slight-pink flowers that seem to grin at me from the shadows. Most of the year, the ground is covered with the lacy, feather-like plumes of leaves that are supported by a dense mat of roots. I first planted yarrow along a muddy slope to hold the soil back and now I can say, it has done more than its job. Its thick root mats effectively ended erosion and broke up the clay for two years while I harvested its medicine. Yarrow can be found as a field herb throughout the northern hemisphere. Everywhere it is found there is a tradition of use as a remedy for external or internal hemorrhage and fever. In fact it’s name Achillea comes from the name of the Greek warrior Achilles who was taught how to use yarrow to heal battle wounds. All parts of the plant will help stop bleeding, although it is usually newer leaves or flowering tops that are used. 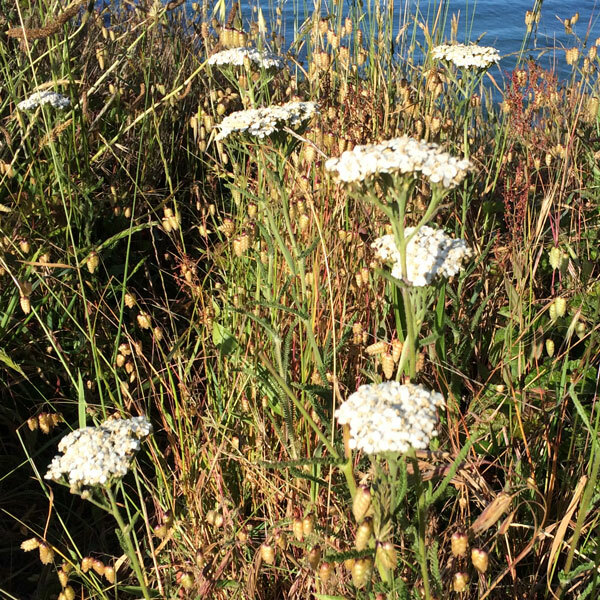 Yarrow is an important herb to have available for first-aid needs. It can be chewed and applied directly to cuts or a poultice can be made. It is rich in volatile oils that are antiseptic, and the herb itself has a drawing quality that makes it very effective for treating wounds that have filled with pus (or better yet, preventing that from happening!) and pulling stagnant heat out of an injured area. Yarrow should be a part of any wound ointment you make. Yarrow’s volatile oils and bitter principle are what make it so effective for treating acute fevers and respiratory infections like bronchitis. For fevers, combine yarrow with peppermint and/or elderflower to push heat out via perspiration. For respiratory infections, you can pick fresh yarrow flowers, put them in a bowl and cover them with boiling water, then place a towel over your head and inhale the steam – the scent is amazing! Those same bitter principles make yarrow an effective digestive tonic. It tones the mucosa of the digestive tract, loosens mucoid plaque and thus helps with absorption. It also helps with bleeding hemorrhoids, and diverticulitis. One of my favorite uses of yarrow is to help regulate the distribution of blood circulation in the body. Yarrow is indicated where there is lots of heat and circulation in one part of the body, say the torso, and too little circulation in another part of the body, like the hands and feet. Taking yarrow as a tincture or tea will help to even the flow, making it especially helpful for treating Raynaud’s syndrome, injuries and aches on one side of the body, and delayed menstruation. Therefore yarrow is helpful for moving stagnant blood whether it is in the liver, the site of an old injury or uterine fibroids. It also may open and clear blood vessels formerly damaged by stroke. Because it is a natural blood thinner, it may be helpful in preventing strokes as well, and can be added to most heart/circulatory tonics. Yarrow stalks are woody and strong and perhaps a sign that the plant has protective energies, especially for protecting those who ‘step in the fire’ to protect others (fire-fighters, lawyers, social workers, healers etc). I find the flower remedy useful for such magical qualities as protecting the integrity of an individual’s energy field, for protection against radiation and maintaining or restoring vitality in the face of environmental pollution or psychic power struggles.